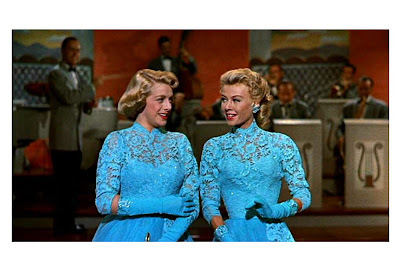 AUGUSTA n For the first time in 54 years, the dresses and one of the fans used by Rosemary Clooney and Vera Ellen during the "Sisters" performance in the movie "White Christmas" will be reunited. A dedication ceremony is planned for Sept. 27 at the Rosemary Clooney House Museum in Augusta. Clooney of Maysville and Ellen of Norwood, Ohio, sang and danced their way through several scenes in the 1954 movie. The fan dance in the "Sisters" scene showcased the talents of both women. Ellen, like Clooney exemplified performers of the era. Her energetic dancing prowess was featured in several scenes of the movie, officials said. “This reunion of the dresses and the fan is a way of solidifying the collection we have been accumulating from the "White Christmas" movie,” said Steve Henry, Clooney museum curator and former lieutenant governor of Kentucky. 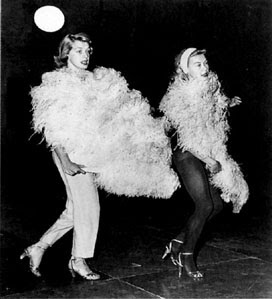 Ellen played Judy Haynes, the love interest to actor/dancer and comedian Danny Kaye in "White Christmas." The sequined blue dress worn by Ellen in the "Sisters" scene was acquired from someone who wished to remain anonymous, Henry said. Its acquisition was confirmed on Tuesday. “There are confidentiality agreements on several of our display pieces, including the Vera Ellen dress,” Henry said. Clooney’s matching dress was dedicated to the museum last year. The semi-faded feather fan, located by accident, was present for the original preview opening of the museum in 2005. The second fan is still in the possession of Paramount Studios, but did not fare as well as the one found and donated to the Clooney Museum three and a half years ago. Ellen continued performing after the movie and died in 1981, movie industry officials said. The dedication ceremony, beginning at 1 p.m., Saturday, includes impressionist and legendary comedian Rich Little, who also has ties to Clooney. “I spoke with Mr. Little and he told me that in his younger days he would often perform at the same venues as Rosemary and Bing Crosby when they were on the road. He was very impressed with them and said they treated him well. He is happy to be included as part of the dedication,” Henry said. Widower of Clooney, Dante DiPaolo, Clooney’s daughter Monsita Botwick and daughter-in-law, entertainer Debby Boone, married to Clooney’s son Gabriel Ferrer, and other Clooney family members may also visit the museum on Saturday, Henry said. Clooney had five children in her marriage to the late film star Jose Ferrer. In addition to "White Christmas" memorabilia, the museum also features items related to movies and mini-series in which Augusta played a role and has been used for and items from Clooney’s family members. In June, nephew George Clooney donated his football uniform from the movie “Leatherheads.” His parents, Nick and Nina Clooney maintain a quiet home life in Augusta. Nick is Rosemary Clooney’s brother. Little, famous for his litany of impressions of politicians and celebrities will be performing at the Washington Opera House, Friday night and opening for Michael Bolton on Saturday night. The museum is located on Riverside Drive in Augusta. There is a nominal donation fee to tour the house. For more on RCHM go to http://www.rosemaryclooneyhousemuseum.com. To contact Wendy Mitchell call 606-564-9091, ext. 276 or e-mail wendy.mitchell@lee.net.